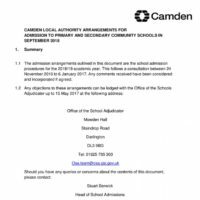 Brecknock is a two form entry primary school in the borough of Camden with up to 60 places available in each year group. We have a full-time nursery with 39 places which is free to everyone. In Camden, the percentage of children attending primary schools rated ‘good’ or ‘outstanding’ by Ofsted is higher – an amazing 98% – than almost anywhere else in the country. Primary pupils in Camden also perform consistently above the national average in test results for 11 year-olds. 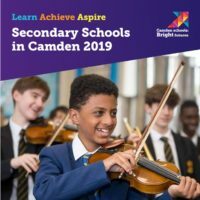 On this year’s combined measure of achieving the national standard and above in reading, writing and maths, provisional figures show Camden primary pupils at 60% – significantly above the national figure of 53%. There is no fixed catchment area as the places allocated on the 5th criteria depend on the number of places reamaining after places are allocated based on the first 4 criteria. We encourage prospective parents to come and visit the school prior to any application being made. A member of the senior leadership team runs tours of the school and will answer any questions you may have, every friday afternoon. To book a place on this tour please contact our school office. If you are bringing a child with you for entry in the middle of a school year we will endeavour to have one of their peers show them round. For more information see the documentation on this page or visit the school admissions website of the local authority you reside in. The closing date for Reception is January 15th, preceding the school year (September –August) in which your child becomes 5. The closing date for Nursery is the end of the February preceding the school year (September –August) in which your child becomes 4. 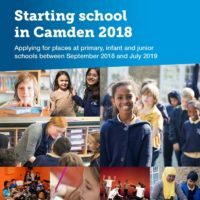 Please note that a place in our Nursery does not guarantee a place in Reception and you must make the applicaiton for Reception through Camden Admissions. 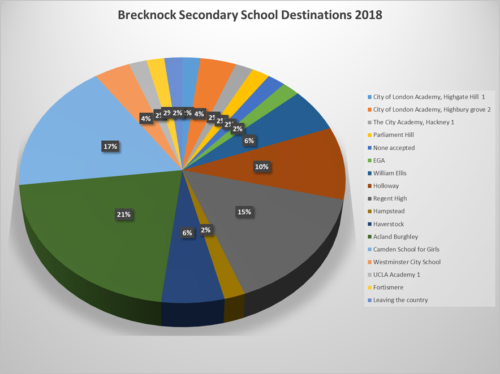 Children at Brecknock attend a variety of local secondary schools. There is no single school our children transition to. We encourage parents and children to visit as many schools as possible so that they can make an informed choice on their application as to their schools of choice. Below is a pie chart showing the distribution of schools our last year 6 cohort (2017-18) moved on to. Applications for secondary school places are made at the start of a child’s final year at Brecknock, year 6. Applications are made to the admissions team for the borough you reside in, regardless of the borough the school you want to go to is in. The documentation you need to do this is found on this page or more information and online applications can be made using the admissions websites listed above. The deadline for applications is 31st October. 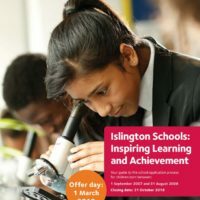 Most schools offer open days to see the school prior to the application deadline. As information regarding these dates is provided it will appear on this page. 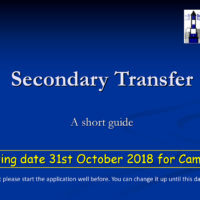 If you have any questions regarding secondary transfer please contact the school office who will help to guide you to where you can find an answer.